Hey trashies, I know it has been a while, but have you been following this crazy story about the secret pot farm hidden underneath Dell’s Maraschino Cherries Company in Brooklyn? 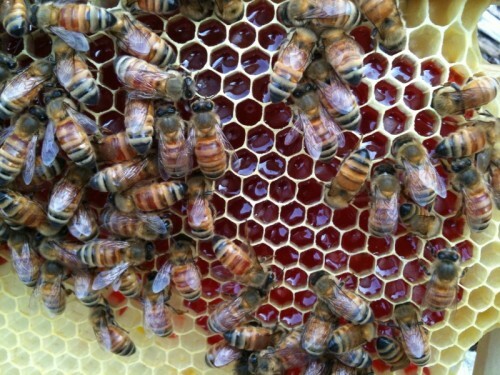 You may remember that back in 2010, Brooklyn rooftop beekeepers complained that their honey had turned bright red and way too sweet thanks to bees feasting on the super sweet discarded cherry waste discarded by the same factory. We posted about it here in 2012, along with links to a similar phenomenon in France where beekeepers documented blue and green honey later traced to M&M factory waste; and I even tasted some mildly affected honey during a tour of Eco Brooklyn’s show house. It turns out, that in addition to possible illegal dumping — allegations police investigated after bee keepers complained — the factory served as a front to a local marijuana farm. And as you may have read, the owner of the factory shot himself when investigators found his pot plants. A tragic end to a fascinating story. Inquiries continue to determine whether the dumping of cherry waste has contributed to polluting the water in Red Hook, a neighborhood already shouldering more than its fair share of industrial strain on the local environment. Nice detective work, bees! Someone needs to make a movie out of this one.